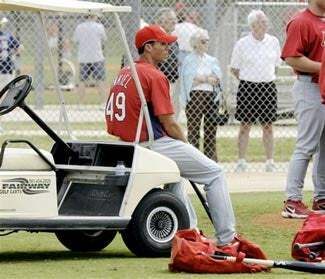 The Rick Ankiel thing, for Cardinals fans, has always been about hope. There was hope in 2000, when we thought we had discovered a 19-year-old Steve Carlton. There was hope in 2001 when we believed a young man could conquer his demons. There was hope in 2003 when we anguished as another young star went under the Tommy John knife. And, yes, there was hope in 2004, when we cheered as the prodigal son returned to rousing applause that was the sonic equivalent of a wool blanket on a cold November night. There was always an innocence to the hope; against all rational thought, we believed in Rick Ankiel because if you could believe in him, you could believe in anything. It made Cardinals fans proud of themselves; it was through our support, we believed, that Ankiel could frame his various comebacks. We would be patient; we would wait for him in a way we couldn't see other fanbases doing. It came from the very best part of us. We were so proud of ourselves. Whatever your thoughts on the jaw-dropping New York Daily News story this morning, that innocence is now replaced with ... something else. It's worth noting — if you'll allow us, as a commenter amusingly put it this morning, to get our Tony Snow on for a moment — that this isn't a case of a guy taking a bunch of HGH, becoming a superhuman and pounding a ton of home runs. In 2004, Rick Ankiel was still a pitcher, recovering from Tommy John surgery and rehabbing in Memphis. (We remind, as Slate pointed out, HGH is hardly a "performance enhancer;" as they put it, steroids are like doing heroin, while HGH is more like smoking weed.) He was a guy who had gone through so much, so much, and was just trying to make it back to a semblance of what he once was, using a substance that was not banned by baseball at the time. As anyone who saw Ankiel at that time knows, the Ankiel of 2004 has no connection to the Ankiel of 2007; that's why his story has been so great, so transforming. Rick Ankiel is not hitting a ton of home runs now because he took HGH in 2004. But yeah: Do we put that much detail into that paragraph if this is Alex Rodriguez receiving HGH, or Derrek Lee? Probably not. Our fellow Cardinals fans will go through similar dissembling over the next few weeks — because this isn't going away; Ankiel is going to be remembered for this much longer than Rodney Harrison ever will — and, as Bernie Miklasz pointed out this morning, certain people will defend Ankiel no matter what, and others will think of him as a juicer until the end of time, and the truth will remain somewhere in the middle. (We certainly aren't going to stop wearing his jersey or anything.) And that, friends, is what this story is really about: It's not about HGH, it's not about the Cardinals, it's not even about Rick Ankiel. Fourteen hours ago, Rick Ankiel was what we loved about sports: His story existed in the black-white world we demand of our sports. His story was pure; it was impossible not to be happy for him. But as much as we try to make it not so — and boy, do we try — the sports world is gray. Ankiel is not a monster or The Bad Guy now that we know he accepted HGH in 2004. But he's not the Guy In The White Hat Here To Save Our Games we all believed — needed to believe— he was either. His story is a human one. His story is gray. It always was. That we now realize this, so vividly, is what we truly lost, at 8 a.m. this morning, picking up our newspaper as we stepped onto the subway, the world entirely different than it had been 10 minutes before, yet, of course, exactly the same.